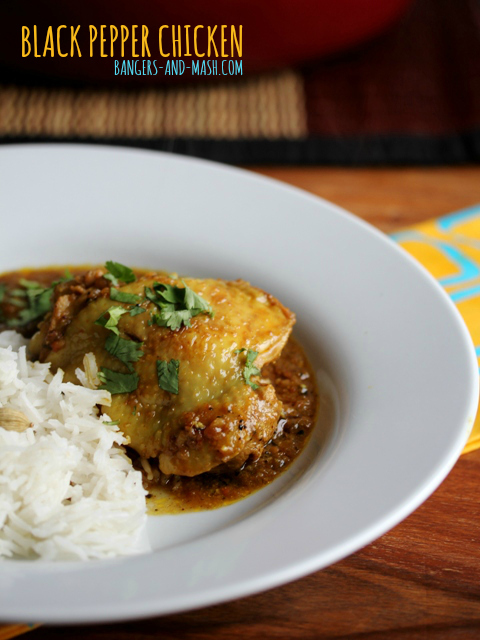 I’d love to tell you some story about how I first came across this black pepper chicken curry when I was backpacking around India, or how I discovered it in some wonderful Keralan restaurant. But in fact this was the first time I’ve tried this recipe and it was the result of looking up inspiration for pepper recipes online. 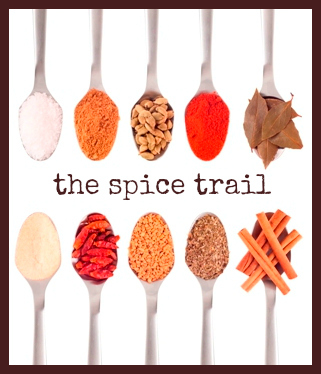 When I started researching something to cook for this month’s Spice Trail challenge, which has peppercorns as its theme, Kerala-style dishes came up again and again. I suppose this isn’t surprising really, since black pepper is thought to originate from the rainforests of Kerala in southern India and it’s still one of the main producers of the spice. Fish curry appears to be a popular Keralan dish, but sadly my husband can’t eat fish so I couldn’t give that one a try. Instead I decided to give this black pepper chicken curry a go. There are hundreds of different recipes for this dish on the internet, so I kind of amalgamated a few together, simplifying it down to what seem to be the core essential ingredients. While I honestly can’t tell you how this compares to an authentic Keralan pepper chicken, it definitely works for me. Surprisingly, it went down well with the rest of the family too. Surprisingly because it packs quite a punch heat-wise. There’s no chilli in this curry, but all that pepper means there’s some gutsy fire in its belly – although not enough to blow your head off. Just enough to be darn tasty and really rather moreish too. Cut slashes into the skin of the chicken, place in a bowl and rub in the black pepper and turmeric using your fingers. Put the onion, tomatoes, ginger and garlic into a food processor and whizz up until you achieve a smooth(ish) puree. Heat the oil in a large pan and add the spices. Fry for a minute before adding the onion puree. Cook gently for about 5 minutes. Add the chicken pieces to the pan, along with any black pepper and turmeric left in the bowl. Cook the chicken for 5 minutes, giving it a good stir now and again. Then add the water, mix well and bring to a gentle simmer. Put a lid on the pan and transfer to the oven for 20 minutes. Remove the lid and cook for another 10 minutes to allow the sauce to thicken a little. 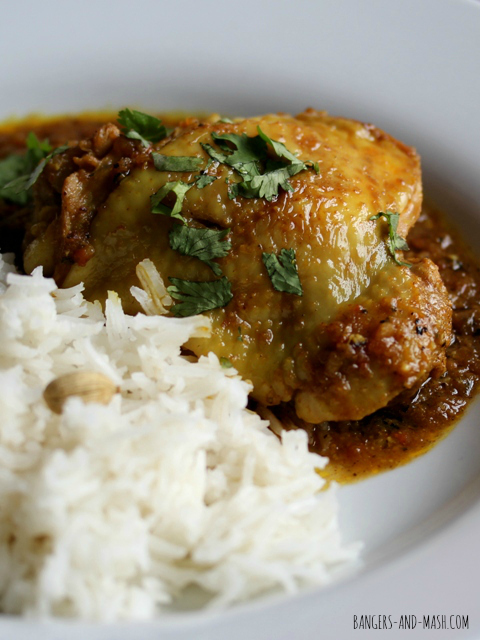 Serve with boiled rice or chapatis and garnish with chopped coriander. 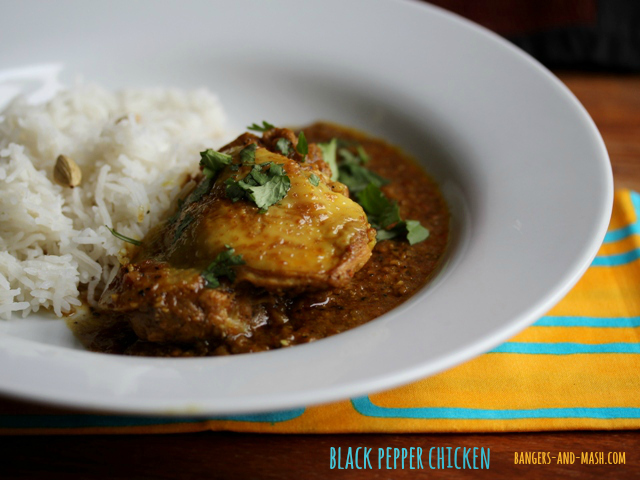 This black pepper chicken is my entry into November’s Spice Trail challenge.